Keep watching Bharti Airtel, In daily charts, the indicators have turned negative, could slide down further. Key daily pivot level is 346.7. Negative below this level. 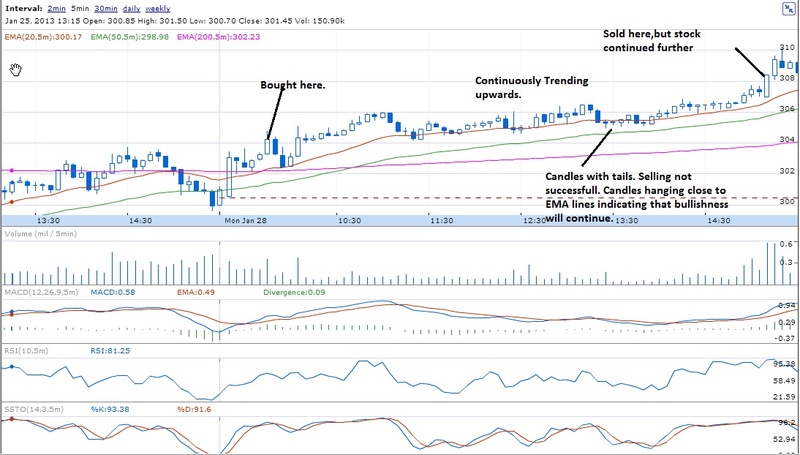 If the stock goes below 342 and stays there, then down trend confirmed. Infosys, Tata Motors and BHEL could continue their downward journey. Keep in watch list. Enter any longs only if Nifty is strong. Or when Nifty hits the supports and bounces back. Do not enter any longs in the initial 30 minutes. ICICI Bank, Axis Bank have turned positive in daily charts. Good candidates for long. 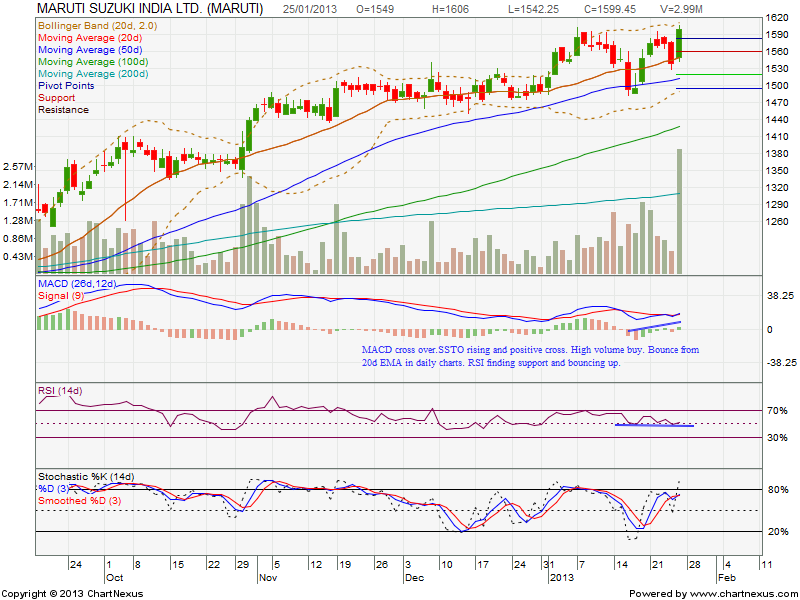 Maruti is another long that can be looked at. Keep all this in the watch list and wait for my updates. 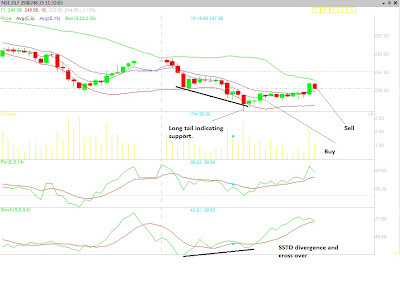 Keep watching Infosys and short below 2794 if it sustains there. BHEL has crossed below its recent support 222. Short for intraday few points gains. 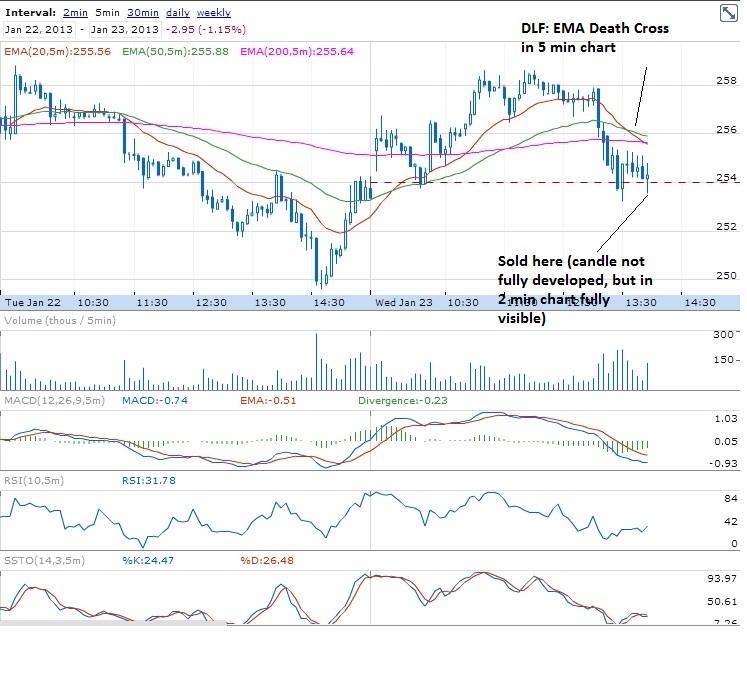 Sell DLF if 264 support is broken convincingly. Today I did two trades as posted in the morning. 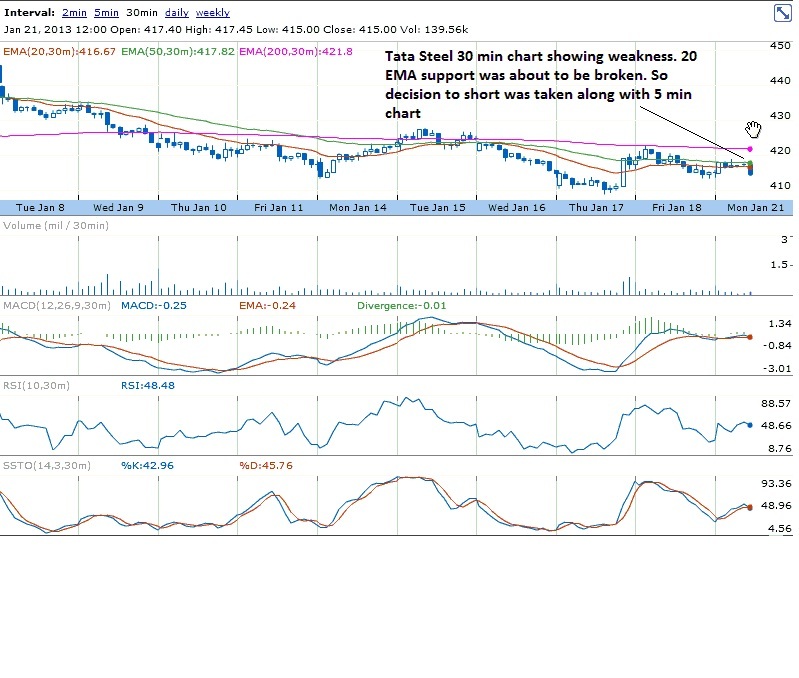 A long in Maruti and Tata Motors. One exited in loss and the other in good profit. Read below. 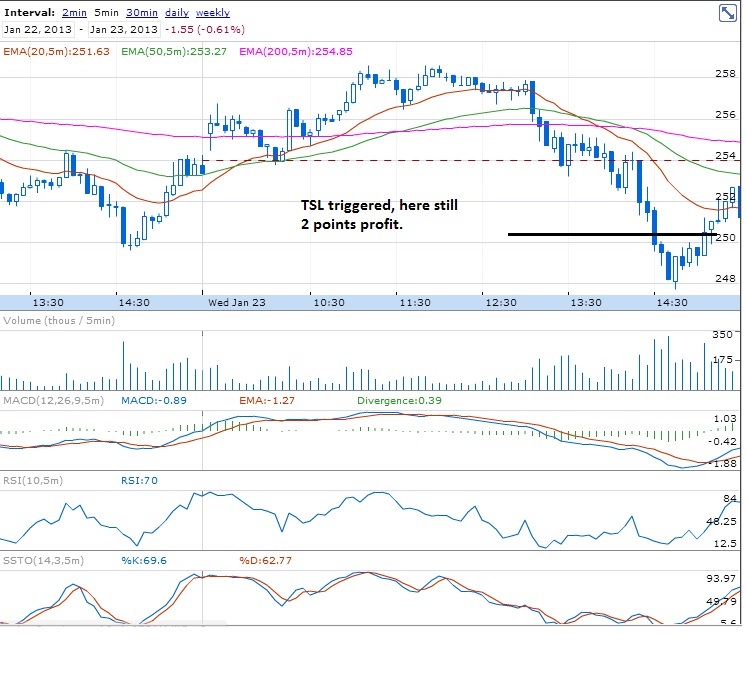 I also provide a trade which I avoided today which otherwise would have been in loss. Maruti was a buy for me in the Swing trade and I thought of doing a day trade in the same scrip as UBS upgrade also came in. I thought that this will prevent the stock from falling. 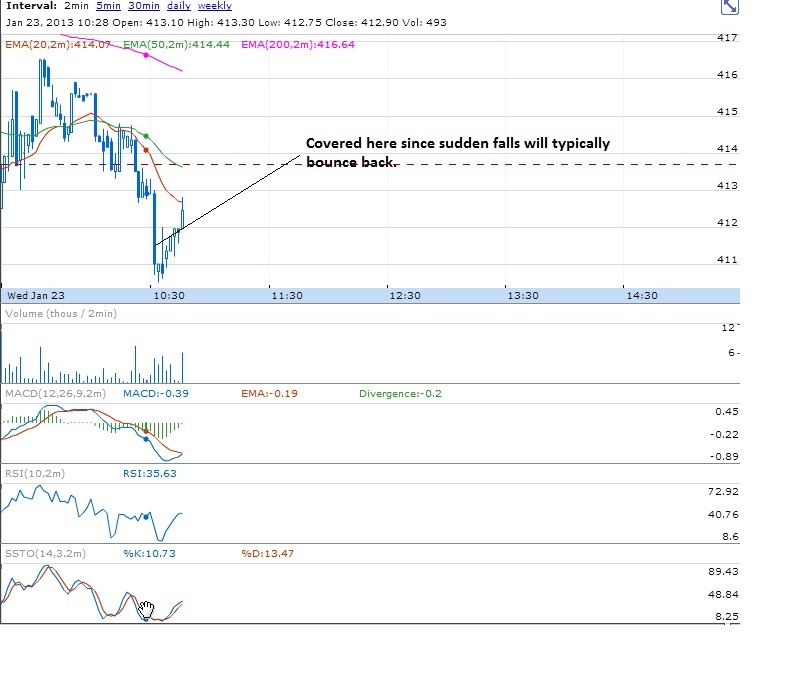 However after my entry the stock consolidated and fell down. Lesson learned. Never buy a stock when it is up on a news. Big players tend to offload stocks on news and small players like us get trapped. This is what happened exactly today. However because of chart signals, I could exit on time. 1. Maruti opened gap up and at 9:15 the upgrade news came. The stock was not moving up or down, but consolidation. 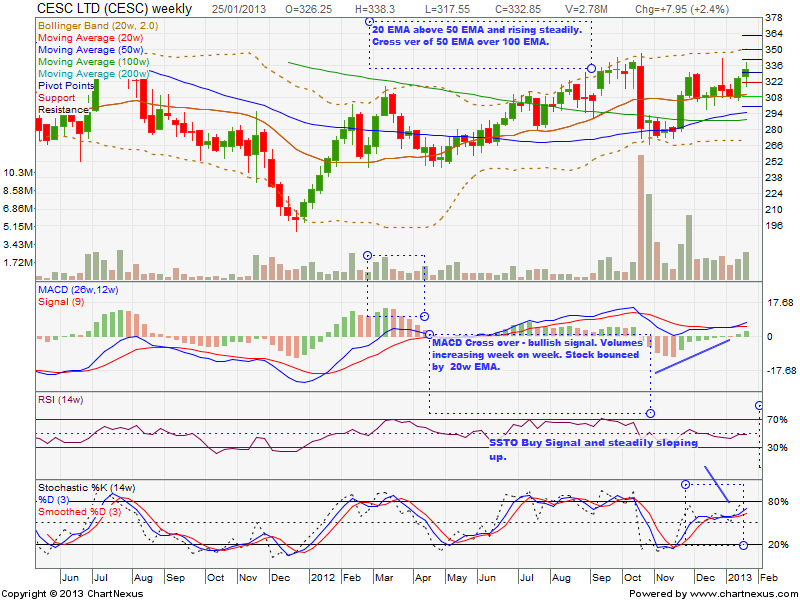 I thought after consolidation the stock will move up and hence bought. 2. SSTO was in buy mode. Rest of the indicators were not strong. 1. 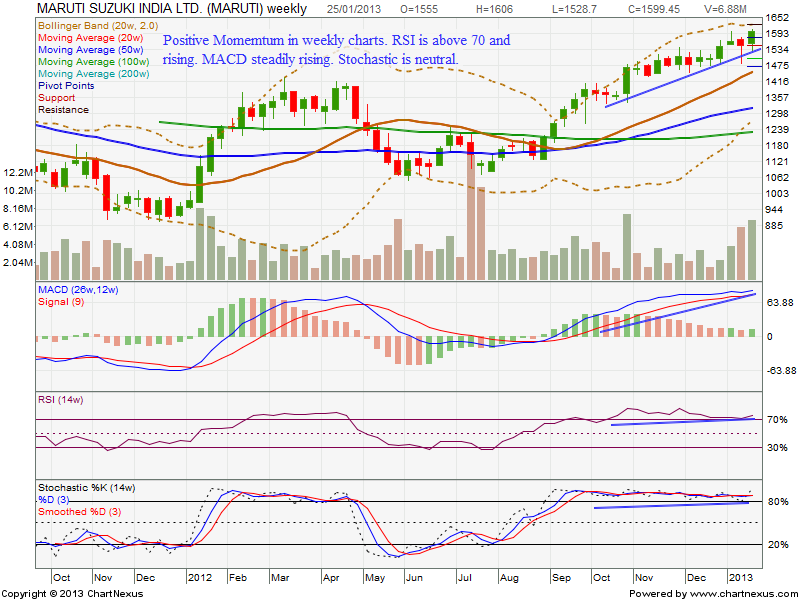 Stock started rising after consolidation. 2. No breakout above the days high was observed. 3. 2 out of 3 indicators were supporting. 2. I tend to ignore a small doji in 30 min chart which was probably signal of end of upmove. 1. 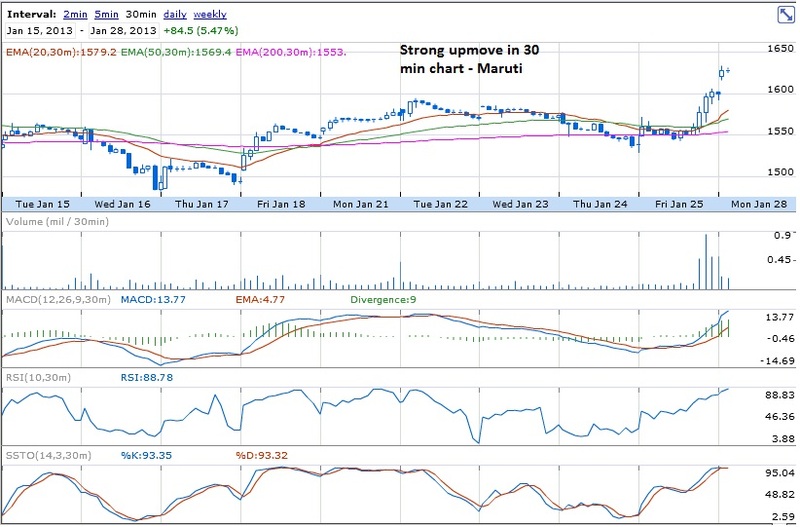 Maruti started consolidating after buy. 2. While consolidating, indicators in 5 min chart were giving negative signals. 3. Breakout in the same direction and candles went below the EMA line. 4. Hence the buy position was squared off with a loss. 5. After that the stock fell continuously and there was no one to buy to bring the price up. This is a similar pattern which keeps occuring in Indian markets especially when stocks move up due to a news. Please another trade of mine few days back here. Today Auto Stocks were in favor in the morning. 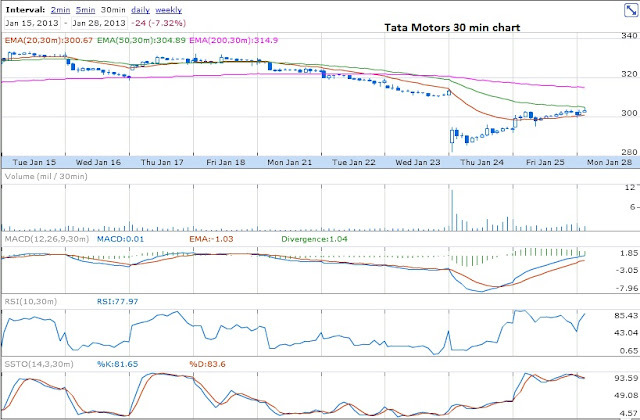 So I looked at Tata Motors. Ever since the gap down on 24th Jan, Tata Motors was steadily rising. 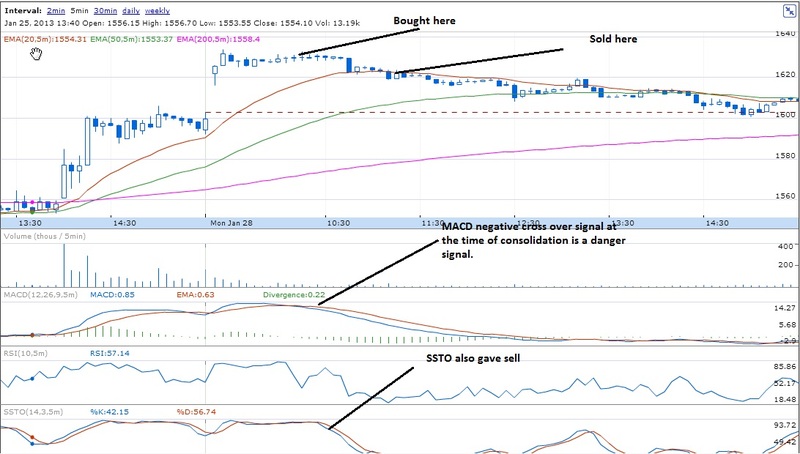 Please see the 30 min chart here. 2. Stock price continuously rising. 4. SSTO was giving a negative and then tending to cross over positive. The stock was steadily trending upwards. In the case of such moves, without much fluctuations around EMA, it is better to maximise profits by riding along the trend. 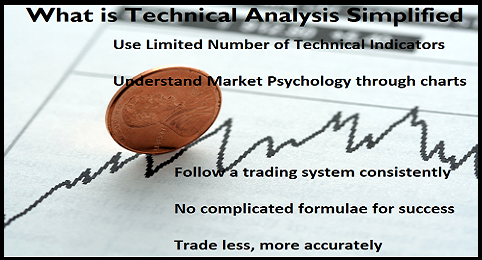 Following Stocks can be considered for day trading on 27 Jan. I do not provide any entry/exit/SL/Targets. 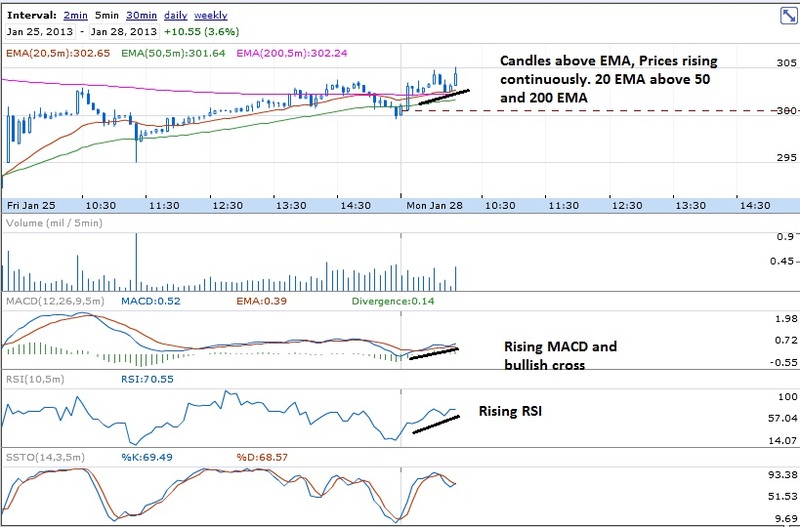 Readers are expected to enter based on charts analysis 15 - 30 minutes after the market open. Please note that next week will be very volatile due to RBI Announcement. Bank Nifty could swing up to 400 points going by the history. This could impact the overall market also. Derivatives expiry is also this week which could add bouts of volatality. Day trading is extremely tough in such a week. Being very close to the terminal , having only one open position at a time. Booking small and quick profits will be the key in such a week. 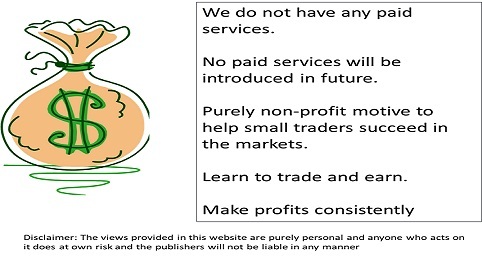 Avoiding trading till Wednesday is adviced for new traders. Wishing you a good trading day and a week !! Todays trade was on DLF. 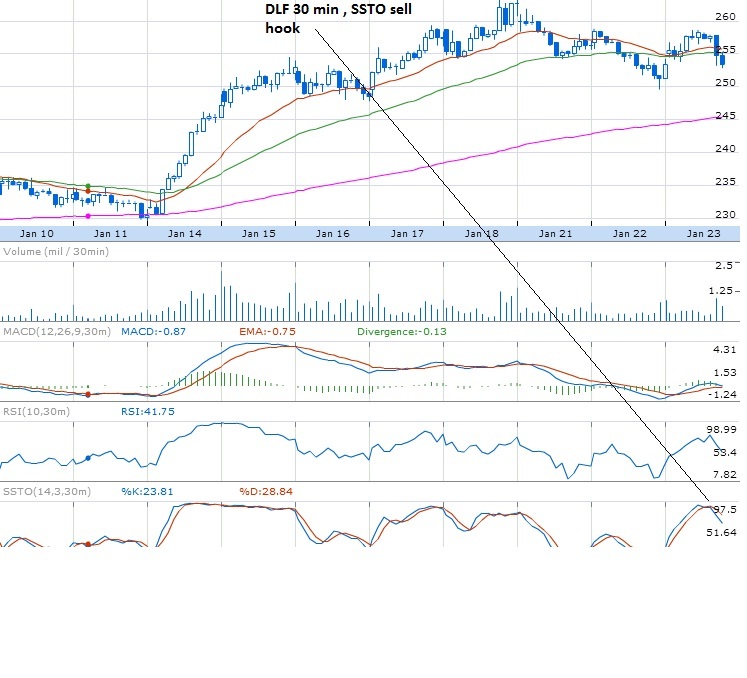 DLF started falling after opening and my trade was based on observing divergences in the indicators.Later on I saw that Goldman Sachs upgraded DLF and hence the stock recovered. Charts gave advance signals even though the news was not known to me. Please see charts for details. 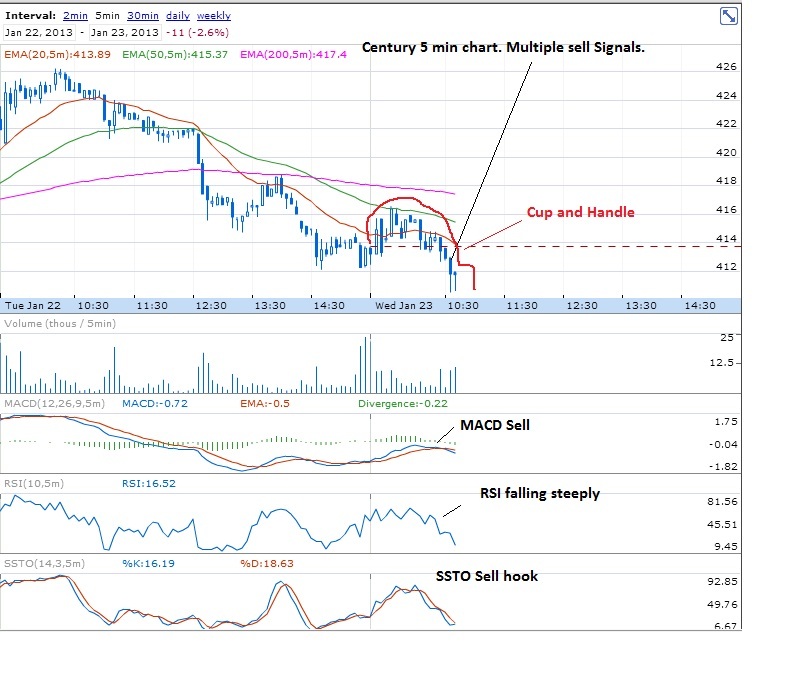 Today lot of brokerages gave a buy on Century Textiles and it started moving up after market open. But the stock started falling down, overall Nifty was also weakening. 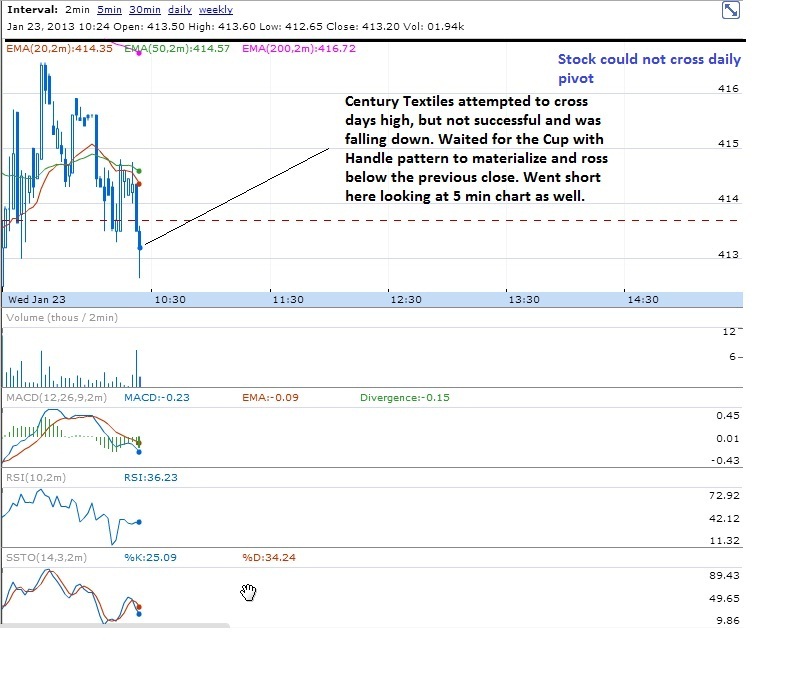 I know that the stoploss for most of long trades were previous close and 412-413 for day traders. Luckily this support broke and I entered a short. Technical reasons for shorts are explained in the charts. 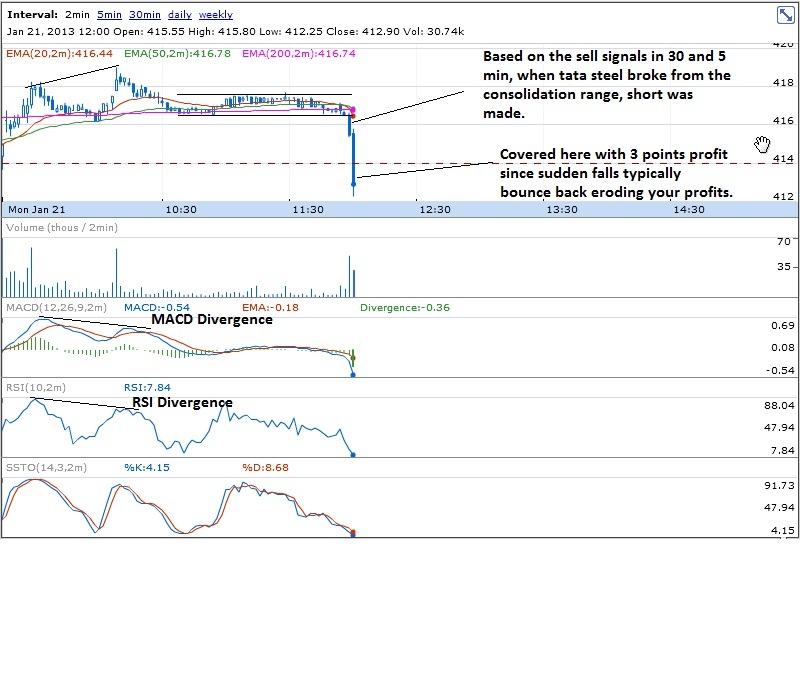 The stock fell down after the short very quickly , so I took few points profit and closed the trade. My second trade on DLF. There were lot of buy call on DLF from brokers, yesterdays business standard paper had given a sell call on DLF. So I was looking for some sell signals in DLF. It went up in the beginning, but started falling with Nifty. 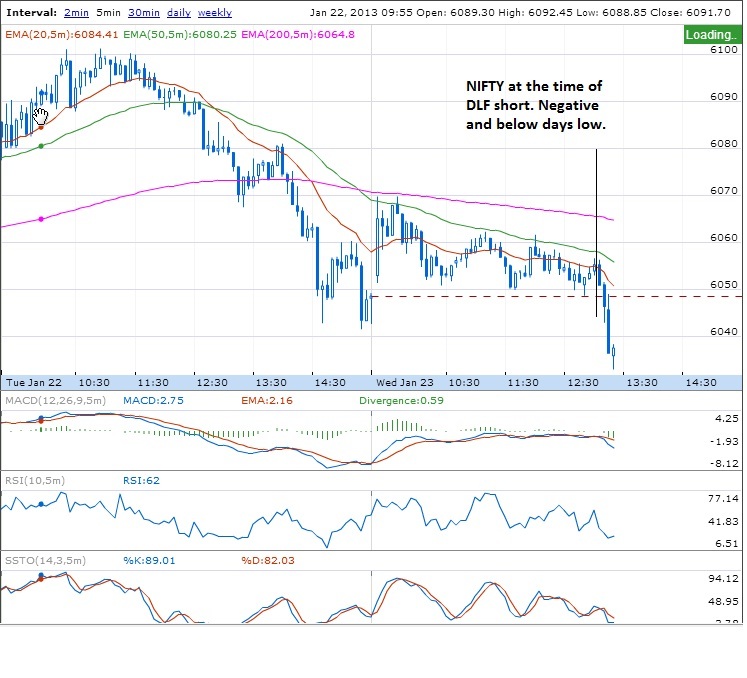 When Nifty broke days low, DLF also broke the days low and pivot. 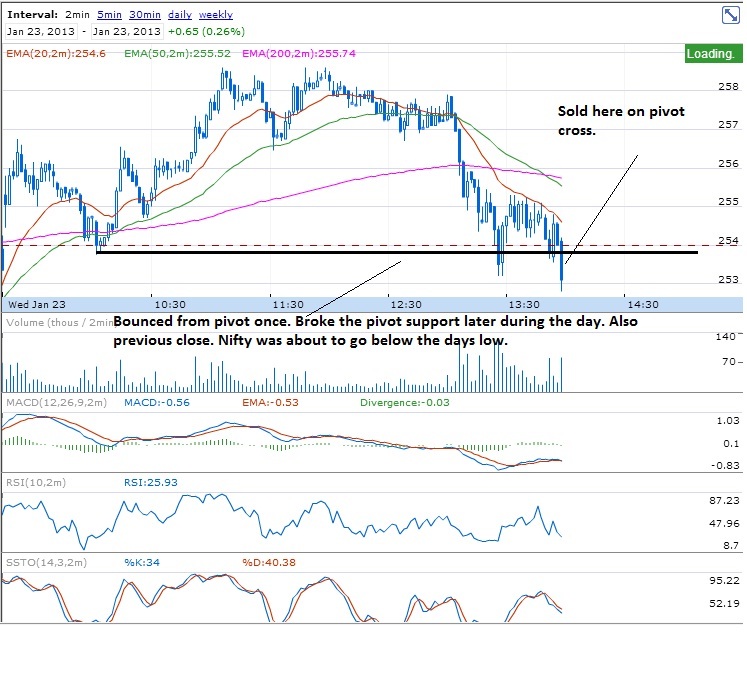 Lot of buying positions would have had days low/previous close / pivot as stop loss. 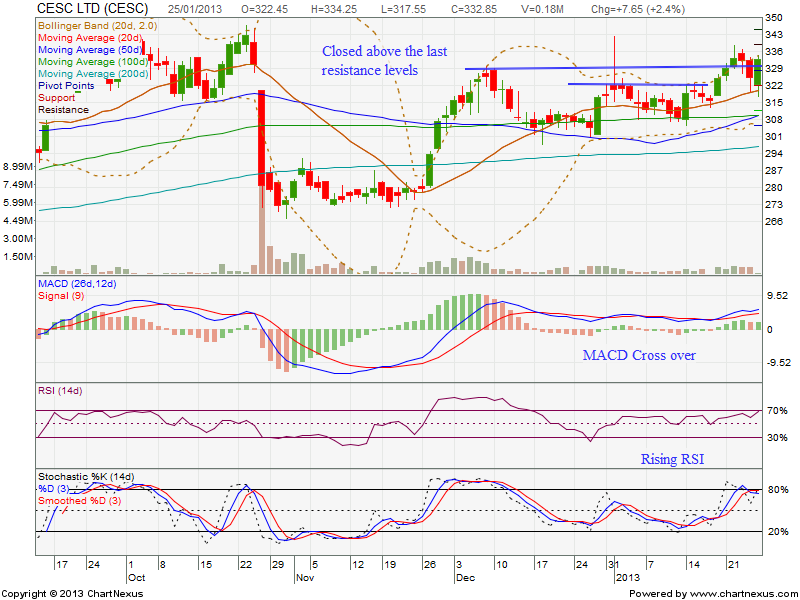 Crossing that is an excellent opportunity since stock will go down at least due to SL triggers before bouncing back. This is what exactly happened here. See the charts. 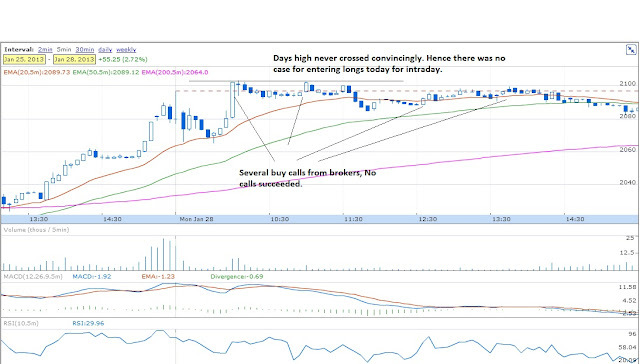 My trade today was a short on ICICI Bank. 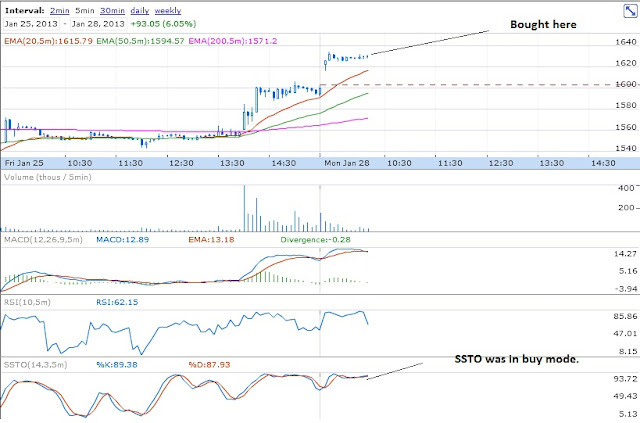 Below are 30 min, 5 min and 2 min charts when I entered the trade. 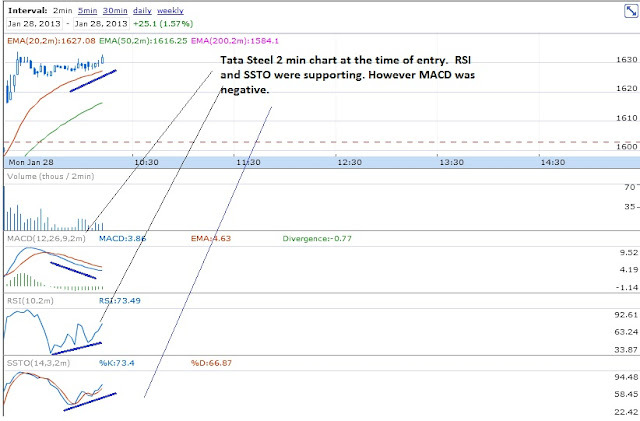 Please see above chart to understand why and when I closed the call. 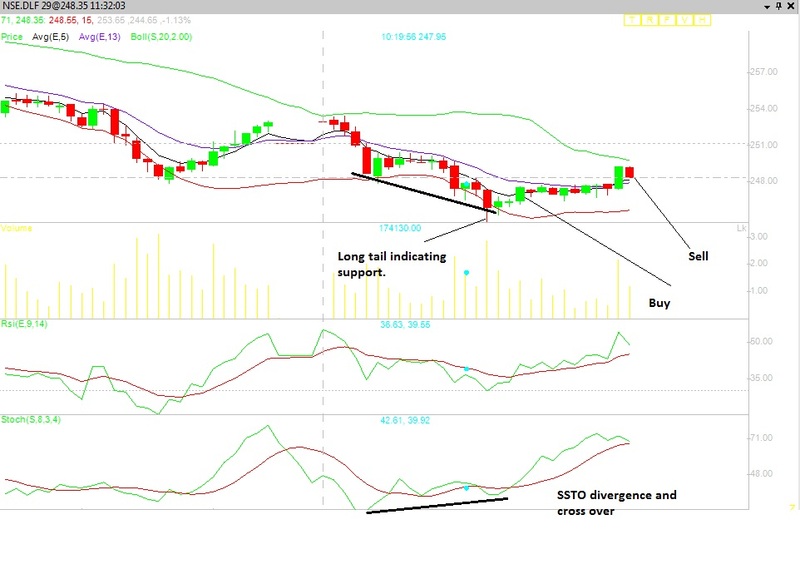 In day trading, the key to book profits, trail SL and ready to close the position if trend reverses. My second trade was a short on Tata Steel. The stock is in a weak trend for the past few days. So I decided to watch this stock when Nifty was weakening. It went up initially , but started consolidating. When consolidation happens, I do not know whether the stock will move up or down. So I wait for a breakout in either direction and also look for indicators - what signals are they giving. 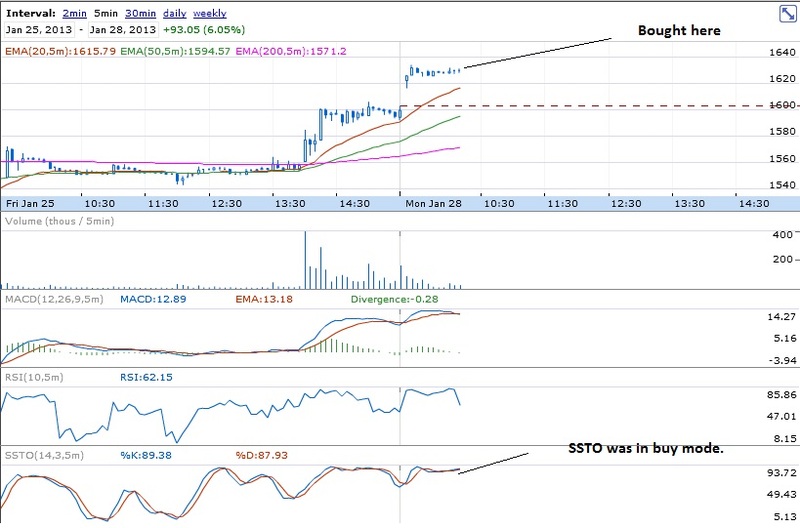 Once I got the breakout in sell direction and already signalled by indicators, I sold the stock. Refer charts below.